The mirrorless camera market is winning a lot of ground and it's something that feels natural. After all, who wouldn't want the same image quality you get in a DSLR, but at half the weight and size, and often cheaper. The Panasonic G7 is the latest addition in the company's mirrorless lineup. It is the successor of the well received G6 from 2013 and it's positioned as a mid-level mirrorless camera. Panasonic have made a tradition of packing a lot of cool features in small, affordable bodies. The G6 was a plasticy small camera that didn't look or feel that good, but it had some great features for still photography, not to mention 50p video which took Canon and Nikon a lot to add to their precious DSLRs. The G7 continues the tradition of generous offering and as a result of that, it looks and feels like a brand new camera rather than just an upgrade. On the outside, the body is completely redesigned. It still looks and handles a lot like a DSLR, which is a good thing and it has a twin dial and more controls on the body. Inside it is powered by a 16 MP sensor, which points out Panasonic's decision to keep the resolution from the G5 and G6. The ISO range has changed however, as it now goes from 200 to 25,600 without expansion. Both the EVF and LCD have been upgraded. The electronic viewfinder has an impressive resolution of 2,306k dots, almost double than the 1,440k on the G6. The LCD screen has the same size and resolution like the previous version, but it has a much stronger backlight enabling a claimed 50% extra brightness. The electronic shutter of the G7 now tops at 1/16,000 second and the maximum claimed frame rate is 8 frames per second. But perhaps the most noticeable feature of the Panasonic G7 lies in its video capabilities, and that's not entirely surprising for the G6 successor. It is the first consumer camera in the world to sport 4k video capture. The results look quite impressive for such a small and affordable camera and it's a testament to the company's long experience in manufacturing video equipment. You don't even have to be a video shooter to benefit from the 4k resolution. You can use it to capture stills at an eight megapixel resolution, with exif data included. The overall feel you get from this camera is that it's a small beast that packs a punch. It's easy to use, yet it has the functionality of a DSLR. The electronic viewfinder is a joy to use and it doesn't make you miss the classic optical viewfinder. The image quality is very good and right up there with other mirrorless cameras in its class and DSLRs in the price range, but when you shift it to video mode, it truly begins to shine. It's the perfect camera for travel photographers who want to pack light and still get solid image quality. It's also very fun to use, something that should never be overlooked when buying a new camera. For that and many other little surprises we highly recommend the Panasonic G7. 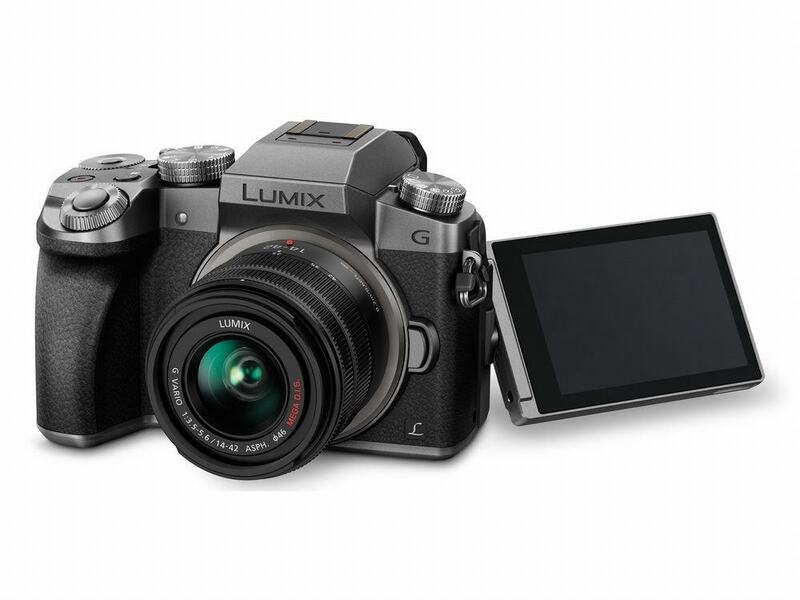 See more specs about the Panasonic DMC--G7 here .